If Veranda's feature this month of a Jackson Hole collaboration between designer Barbara Barry and architect Peter Block left you wanting more, you'll certainly enjoy this skillful collaboration executed right here in Atlanta. 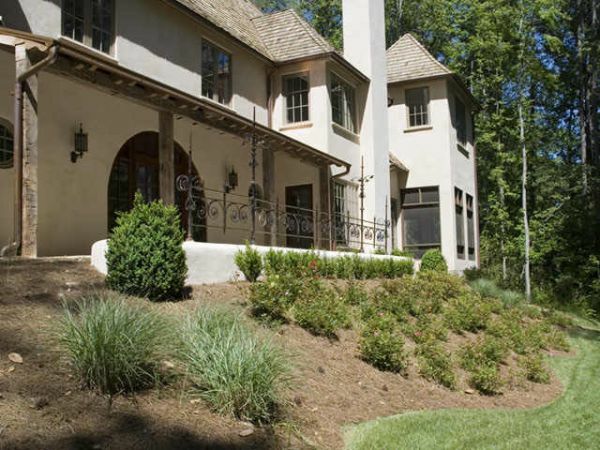 This new home designed by Peter Block is situated literally across the street from Chastain Park and caught my eye early last year when it was under construction. At the time I wasn't familiar with Peter Block and was pleasantly surprised to see such striking architecture on the Eastern side of Chastain Park. Typically such architecture has been reserved for homes West of the park. The home was built by Woody King of King Developers. After some research I learned that Woody and his wife, Meridy King - an interior designer, work together on his speculative homes infusing them with unique architectural elements and antiques from their travels in Europe. You may recognize the Kings' name as their personal home recently graced the cover of Atlanta's esteemed Beacham Series. 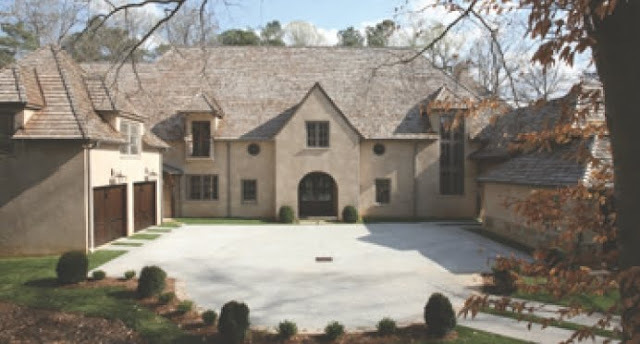 Meridy's work was also featured recently in the October issue of Atlanta Homes & Lifestyles. Some of the distinctive touches incorporated in this house include floors from a church in England, beams from France, and an iron window from Europe. In the photo above the intricate detail of an iron railing on the house's terrace, which overlooks a creek, stands out. Notice also the rounded French doors. You can't see from the photos in this post, but the home's front door looks through the house all the way out to the back of the house via the doors above. At the far end of this picture is a screened-in porch off of the kitchen. Another interesting detail of the home is the front door's rounded arch being a continual theme throughout the home. 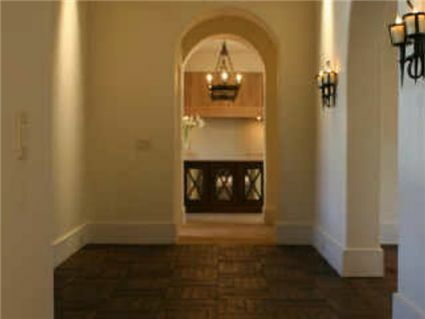 The photo above affords a sideways view of the hallway that you enter through the front door of the home. As you enter, to the left (straight ahead in the photo) is the kitchen. 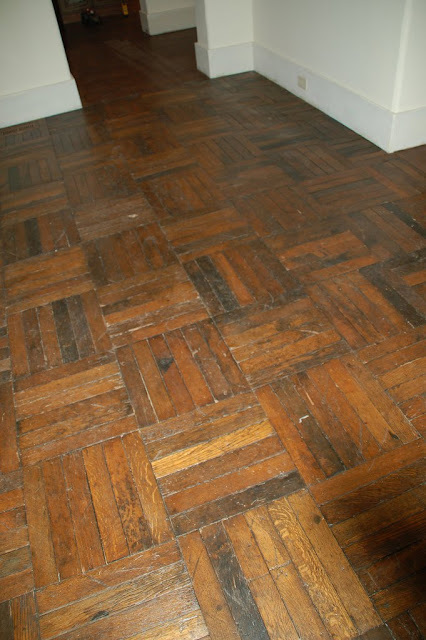 The hardwood floor in the front hall is done in a parquet finger pattern with reclaimed wood from a church in England. A detail, which doesn't show up well in the photos, is that many of the walls are done in plaster, adding to the old world charm of the home. 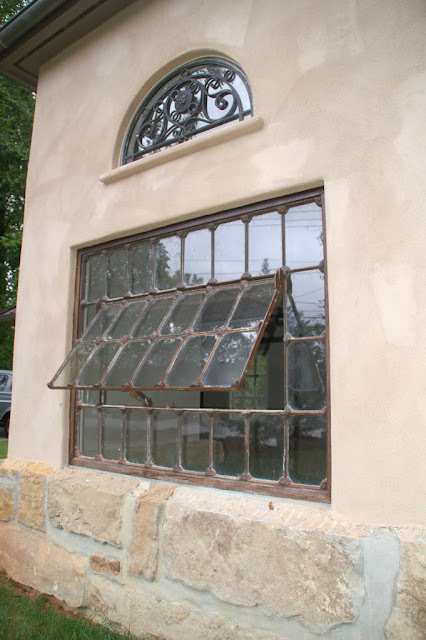 I admire this antique iron window on the third garage bay a few times a week as I pass by the home on regular bicycle rides in the area. 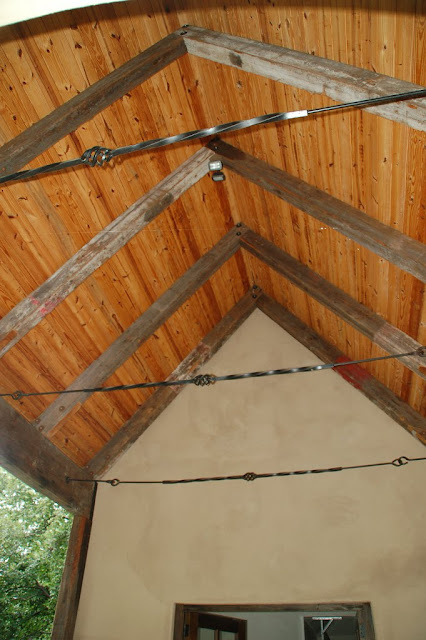 Connecting a side entrance from the home to the third garage bay is this port o'cochere framed in antique beams. If you look closely, you can see remnants of paint from the beams' former lives. 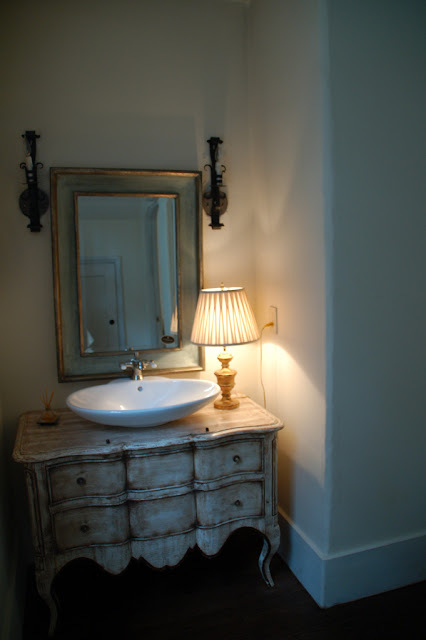 Instead of using a more stereotypical vanity, the Kings opted to use a piece of furniture in the powder room. 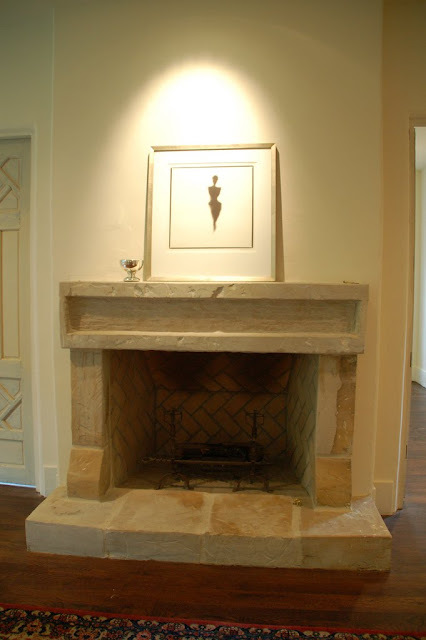 I found the unique, chunky limestone fireplace surround to be a nice diversion from the norm as well, adding to the overall authentic European feel of the home. 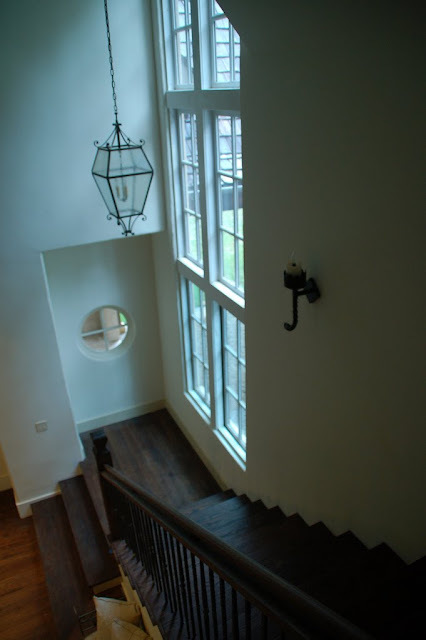 A view down the main stair way affords a glimpse of the standout architecture of Peter Block. 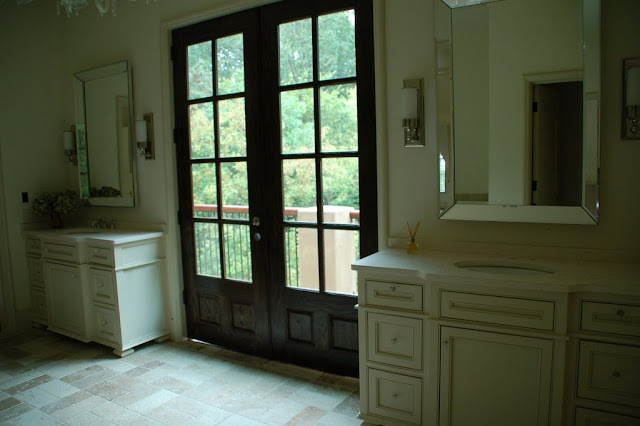 A final view into the master bathroom gives a glimpse of the upstairs terrace across the back of the home. I hope you enjoyed the tour of this new Atlanta architectural gem. The home recently sold to its first residents and I understand they are investing a significant amount of money to put on the finishing touches. I'm sure it will be amazing. Great post! I really enjoyed seeing this house in person earlier in the fall. Meridy is a great design talent, and Woody is a great builder. Peter Block's architectural style is the perfect match for the Kings. TTI told me about your blog today. It's great to have another Atlanta blog about our favorite subjects. Thanks for pointing out McAlpine. I'm also a fan and would enjoy seeing more of his work here. It's funny: an architect (Bob DeFiore) is doing a house on my street. I continually pester him with questions. Once we were talking about hand-renderings. He said, I should see the work of one of my Auburn roommates: He'd wait until the last minute on school projects and still do work better than everybody else. Who? Bobby McAlpine. I love the detailing of this home...just about perfect. I'm jealous of whoever got the commission to finish the interiors, it would be a delight to furnish! Your blog looks wonderful. Love the header. Very enjoyable. You and I are going to get along just fine. when i first saw the spread in Veranda this month, I almost fainted! This home has an incredible amount of details that I adore. The ironwork, arches, reclaimed materials.. I hope we get a peek when completed by the new owners..
Congratulations on starting this blog, welcome !! That house has some kind of WOW. Glad to see a new 'face' in the shelter blogosphere - looking forward to much more!!! Gorgeous look. Reassuring to see that great "old world" design is still possible with new construction!! James, So Happy I was sent over to visit your blog. What a gorgeous home!! I will certainly come back to see more. I have fine art for your clients! *** STUNNING, STUNNING STUNNING!!! It's simply wunnnnaful~~~ so calm & peaceful, beautiful and welcoming... what more could anyone ask? I love this house as well, and had the pleasure of shooting it. If was in our last magazine, and if you want to do a follow up post and feature some of the photos I took you are welcome to them. GREAT TASTE!! What an amazing home to feature. Woody and Meridy are amazing people and I am so happy for them on the sell of this home. KEEP UP THE GREAT WORK! 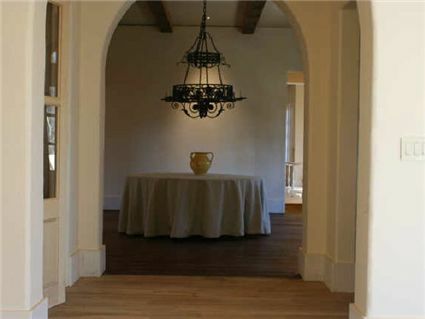 The details in this home are amazing: reclaimed beams and floors and plaster walls-wow. Great to learn about your blog; warm welcome to the Atlanta design blogosphere! Thank you all for welcoming me to the blog world. @Terry: Nice to meet you finally. I've been following your blog for sometime and enjoy all of your posts on art. I need to get down to the Castleberry Hill art strolls. It's been awhile. Also great info about Bob DeFiore. I wasn't aware of him. @doug: I'm not aware of who's doing the finishing touches. Perhaps Meridy. I did hear that a pool was being placed behind the home. @Trouvais: Hi Trish, I recently found your blog and have been loving every post. I'm glad you enjoyed mine. @This Photographer's Life: I assumed you must have shot the home. I'd enjoy seeing your pictures at some point. Just found your blog and LOVE it. Beautiful homes. Meridy King is my husbands cousin and it was a nice surprise to see she and Woody's work featured. She has gorgeous taste.